An inverter welder is a relatively new and innovative type of welder that has a host of advantages when compared with the conventional welders that most of us are accustomed to. Inverter welders use sophisticated silicon based technology as compared with heavy copper/aluminum transformers and rectifiers seen in traditional welders. 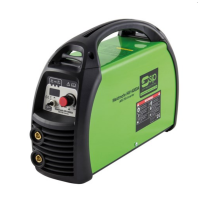 One prime advantage of inverter welder is it is small, compact and in a way portable and can be carried around like a light-weight briefcase. Inverters use much smaller transformers and hence they are sleek, more compact, weigh light and portable. This is in striking contrast to a conventional welder that is notoriously cumbersome and can not fit into narrow spaces. They also consume less power and can operate on normal household current. Lower power consumption means that the inverter welder can be plugged into any normal wall socket with household current instead of high voltage current. The multi-functional SiP Weldmate HG1400DA ARC Inverter Welder is equi.. 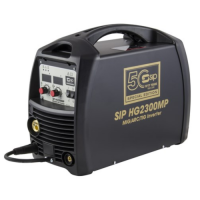 The SIP 50th Edition HG2300MP Inverter Welder is a Special Edition pro..